C# is one of the few programming languages which allows you to create amazing cross platform Mobile Apps, Games and PC Programs. Learning C# programming language makes it easier for you to understand other C-based programming languages. C# was created and is maintained by Microsoft so you know it gets plenty of support. This software giant is continually adding new and more potent C# features including new versions of C#’s Visual Studio. And the Visual Studio toolset is widely regarded as the #1, A+, five-star, gold-plated, best development environment on Planet Earth. Master C# fundamentals in 6 hours — The most popular course with 50,000+ students, packed with tips and exercises! Every section in this course comes with a few bite-sized video lectures and a quiz or programming exercises. These exercises are carefully chosen from academic and real-world examples to train your “programming brain”. In essence, you’ll learn how to work with classes, constructors, fields, properties, methods and indexers, how to use encapsulation to reduce the impact of change, how to improve the robustness of your code, how to re-use code using inheritance and composition, how to build extensible applications using polymorphism, how to develop loosely-coupled, extensible and testable applications using interfaces. Each section is equipped with a balanced mix of theory and practice. At the end of each section you’ll get exercises to master the concepts you learn in that section. Master the confusing C# constructs: Events, Delegates, Lambda Expressions, LINQ, Async/Await and more! Learn C# Programming — WPF, Databases, Linq, Game Development with Unity. 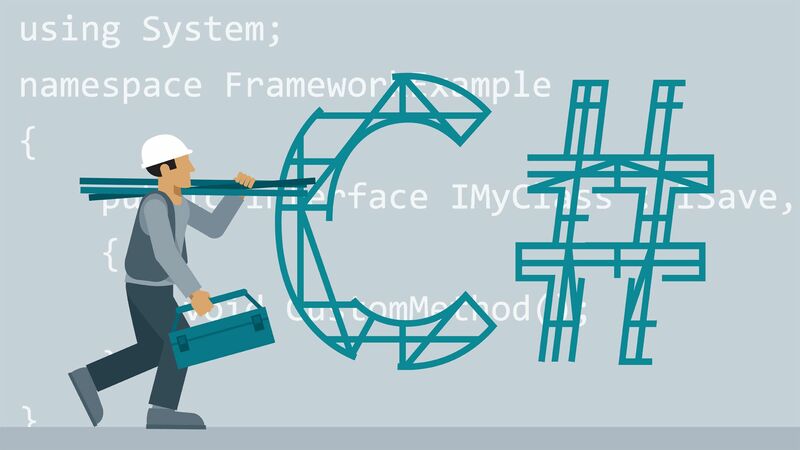 More than just the C# basics and fundamentals! You start off by learning the C# basics and C# programming concepts in general variables, methods, arrays, if statements,and loops. Then you learn the three pillars of Object oriented programming which are classes and objects, inheritance, and polymorphism. Once you mastered them you will go into advanced C# topics, such as Databases and LINQ. With this course, you will be able to recognize and apply design patterns, refactor existing designs to use design patterns, and reason about applicability and usability of design patterns. This course provides a comprehensive overview of Design Patterns in C# and .NET from a practical perspective. This course does not use UML class diagrams; all of demos are live coding. It uses Visual Studio, various NuGet packages, R# unit test runner and even dotMemoryUnit. This course is divided up into sections and each section is a console application that we will be developing from beginning to end. At the end, when you have built our application, you are going to go ahead and write unit tests in order to verify the functionality you have just created. You will see the dos and don’ts of programming, you will understand and internalize concepts in a way in which you can use them freely in your own projects or products, instead of simply copying and pasting things without having a proper structural and foundational understanding. Each of the topics will be looked upon in great detail, and each of them are accompanied by a variety of Exercises. In this course you will get every single lecture systemized in such way, that it ensures smooth transition between the previous and the following topic. Learn C# like a Professional! Start from the basics and go all the way to creating your own applications and games! Learn how to design windows forms, create buttons, dynamic texts, labels and many more components. Learn to develop functions and classes in C#. In this course you’ll actually create real, live applications that run in the console. You’ll get in there and declare and manipulate variables. You’ll write “Flow of Control” statements we call “Loops and Conditions.” You will learn how to create methods for code reuse and readability.